Hike the Grand Canyon to really experience it. I really wish this is something more people would take to heart. ...and for an hour or less! Even if you stay on the South Rim and watch the light play on the canyon and see the colors change..
You will miss the extra dimension you get when you venture down into the Grand Canyon. If your time is short, you can hike the Grand Canyon part way down. You can do this on either the Bright Angel Trail or the South Kaibab trail. Even getting 3 or 4 hours down one of these trails will take you on a geologic safari back in time. Information along the sides of the trails tells you how old the rocks are that you are hiking through. And looking back up at the rim, you get a whole different feel for the canyon. If you have more time to hike the Grand Canyon, plan to hike all the way to the floor of the canyon... and even venture at least part way across if you can. There are a limited number of back country permits available for each day. You need to apply well in advance to obtain the permits. You can call the Park Service on the first of the month, three months in advance of the day you want to hike. For popular dates it can be very hard to get through and get the reservation, so have alternative dates in mind. You can e-mail or Fax requests, but when we went, phone reservations had priority. There are a small number of permits available once you arrive, especially for visitors from abroad who might not be aware of the requirements and the popularity of the hikes. 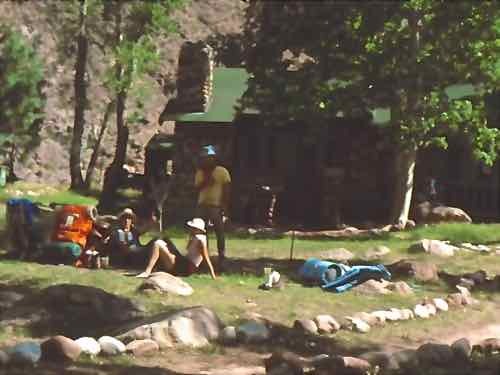 If you get reservations to stay at Phantom Ranch, you can make the hike without a back country permit. There is a Phantom Ranch Canteen where some food and beverages are available. For meals at Phantom Ranch, you must make reservations... and they should be made well in advance. This is because everything that goes into and out of the Grand Canyon goes by mule... that steak dinner that you have at Phantom Ranch was packed in... and all the garbage has to be packed out... BY MULE! A good way to see different parts of the canyon is to hike down the South Kaibab Trail and up the Bright Angel trail (or visa versa). Hike part way across the canyon for a more in depth experience. You can hike rim to rim if you have several days to hike the Grand Canyon, but you must plan for how to return to your starting point. There are campgrounds along the trail that will take you all the way to the North Rim. Or you can hike to Roaring Springs and back to the South Rim. It takes a lot more planning to hike rim-to-rim than it does to venture into and out of the canyon from one side. 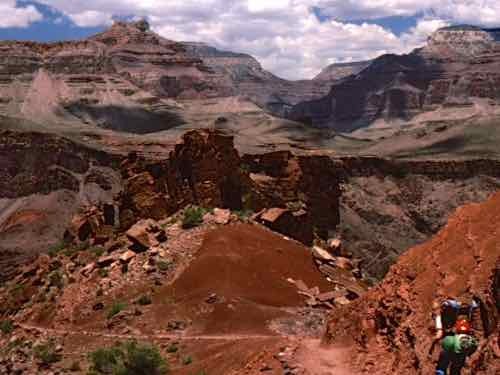 There are campgrounds for backpackers near Phantom Ranch and spaced out across the canyon. You MUST have a wilderness permit to camp in these. The Rangers WILL check on this. The campgrounds have water and toilet facilities. You must camp in the campgrounds to protect the fragile desert environment of the canyon floor. You are hiking from elevation down into a desert environment. Be sure to carry PLENTY of water. If you're taking a day hike... remember that the last half of your hike will be ALL UPHILL!!! We were worried about the heat, so we got up EARLY... hiked to the river in the dark, then started our climb out. We discovered that we had to put clothes ON as we hiked out. There is such an altitude difference that the low temperature on the valley floor was warmer than the high temperature on the rim! 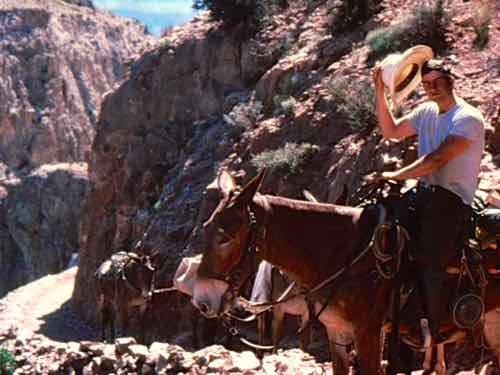 ...there are also overnight mule trips into the Canyon with stays at the Phantom Ranch. All of these options are extremely popular, so plan to get your reservation in advance.... and go ahead, hike the Grand Canyon.